A few days before Louis Blériot entered the history books as the first person to cross the English Channel in a heavier than air flying machine, Hubert Latham (1883-1914) had taken off from France. He had flown 8 miles before his engine failed. On the morning of Blériot’s epic flight, 25 July 1909, as it was windy, Latham’s advisors let him sleep. Nonetheless, there is a statue to Latham near Cap Blanc Nez, outside Calais. 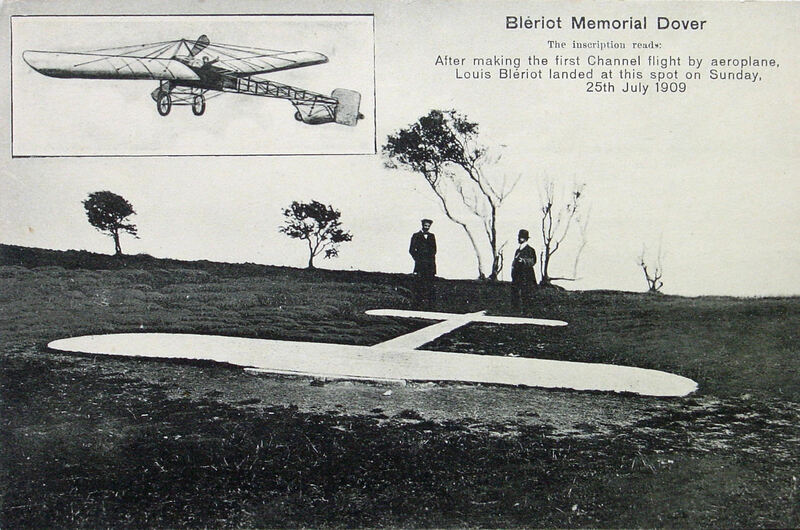 While on Northfall Meadow, Dover, there is a life size monument depicting Bleriot’s aeroplane. Less than a year later, on 2 June 1910, Charles Rolls (1877-1910) made a return flight across the Channel. Leaving Dover at 18.30hrs was over Sangatte, France, at 19.15hrs and was back in Dover at 20.00hrs . Over 3,000 people witnessed the event, after which he was carried through Dover, shoulder high. A month later Charles Rolls lost his life in a flying accident at Bournemouth, a bust of him can be seen on Marine Parade. 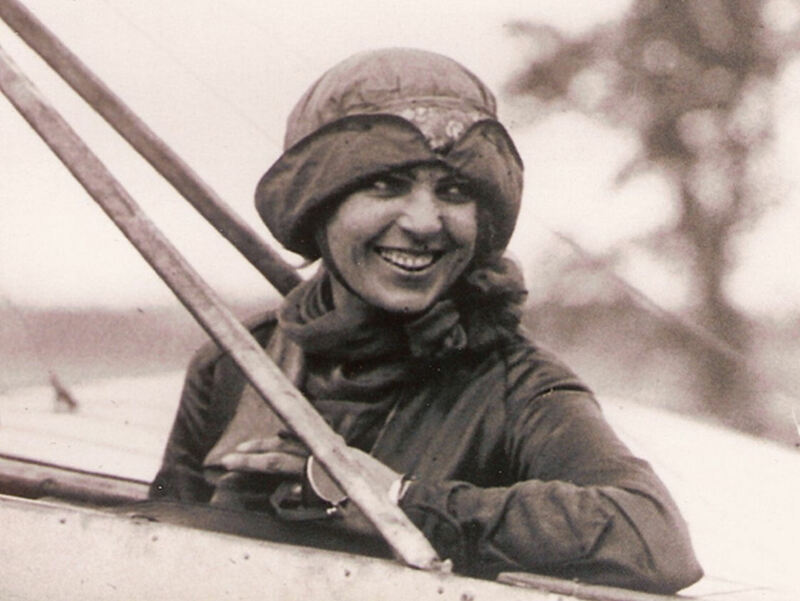 On Tuesday 16 April 1912 the first woman, Harriet Quimby, (1875-1912), flew across the Channel. Many, including this author, feel that there should be a monument, a road name or even a plaque in Dover/Whitfield or Northfall Meadow to celebrate her achievement. 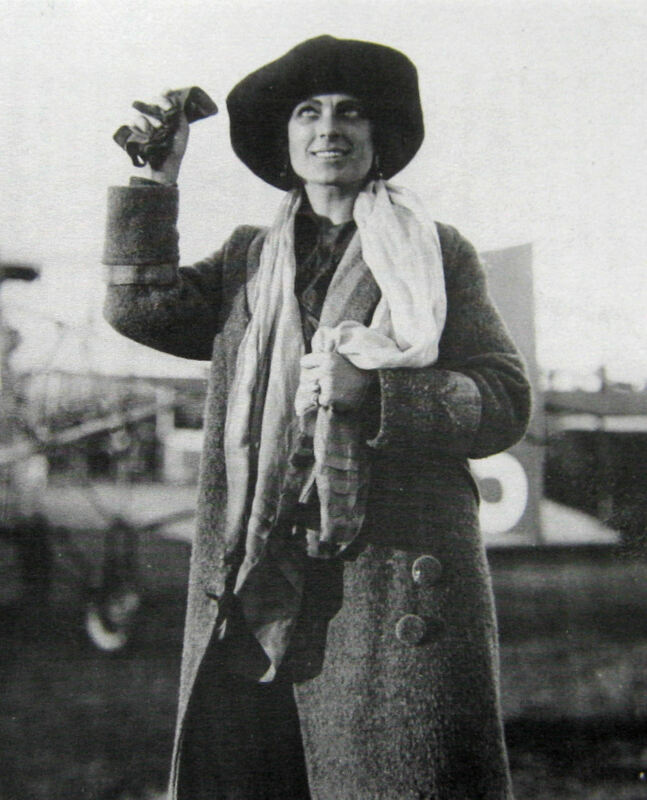 Harriet, a journalist, gained her pilot’s licence in August 1911, the first woman to do so in the US. By Christmas, she had decided to be the first woman to fly across the Channel and through contacts, managed to get a letter of introduction to Louis Blériot in Paris. On 1 March 1912, Harriet set sail for London on the Hamburg-American liner Amerika, and on arrival put her plan to the editor of the Daily Mirror. Her next stop was Paris, where she placed an order with Blériot for a seventy-horse-power machine. At the same time, she persuaded Blériot to loan her a fifty-horse-power monoplane for the Channel crossing. Blériot agreed and suggested that the aeroplane should be first tried out from his airfield at Hardelot-Plage, about 25 miles (40 km) from Calais. On arrival at Hardelot, Harriet was keen to undertake trials but the weather decided otherwise. The wind increased throughout the first day and on the second, it blew a gale. The weather showed no sign of abating but as the Daily Mirror had set a deadline, she ordered the monoplane should be shipped to Dover. Concerned about keeping the whole venture a secret, the monoplane was delivered to an aerodrome she described as having, “a fine, smooth ground from which to make a good start. The famous Dover Castle stands on the cliffs, overlooking the Channel. It points the way clearly to Calais. ” This was at Whitfield, outside of Dover. Harriet stayed at the Lord Warden Hotel in Dover, where she met reporters from the Mirror. The following day, Sunday, was perfect for flying, “there was no wind. The sun was bright and warm. The air was so clear that by straining our eyes a little we could see the French coast dimly outlined across the channel.” However, Harriet’s mother had asked her never to fly on Sundays. 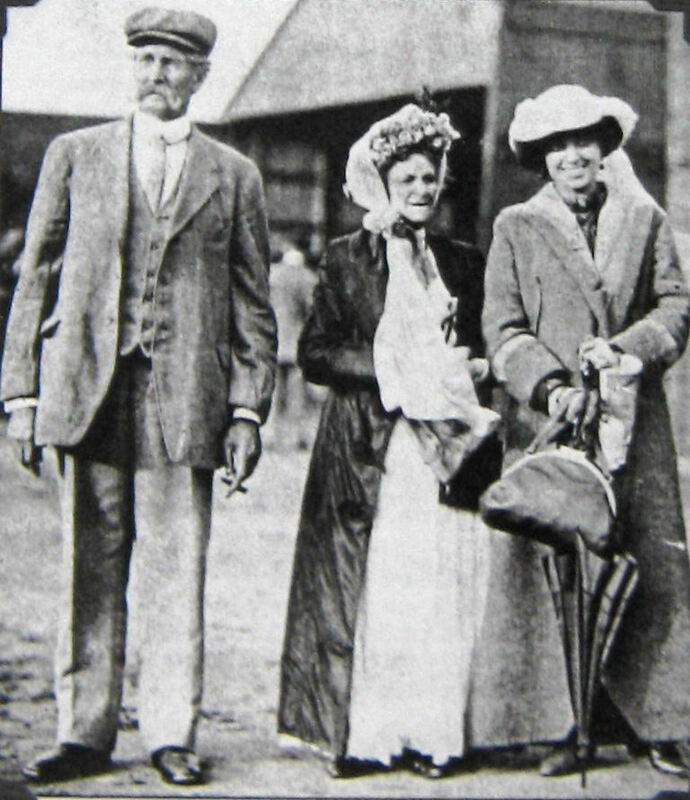 Instead, she and aviator, Gustav Hamel, went to Whitfield to inspect the Blériot monoplane and for Gustav to show her how to use a compass. On arrival, a crowd of reporters and spectators greeted them, as rumour had spread that a woman was going to attempt to fly a solo Channel flight! 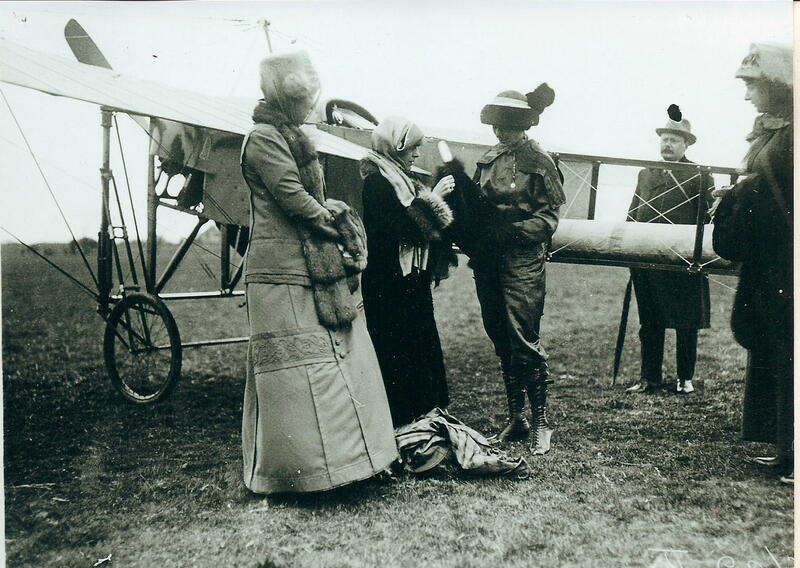 The following morning, Monday, Harriet, Hamel and the Mirror reporters all geared themselves up for the flight, but strong winds made it impossible. However, by 03.30hrs on the Tuesday, the wind had eased. Dressed in a flying suit of her trademark, purple wool-back satin, she wore two pairs of silk combinations underneath. Over the apparel, she wore a long woollen coat, an ‘American raincoat’ all topped with sealskin stole. 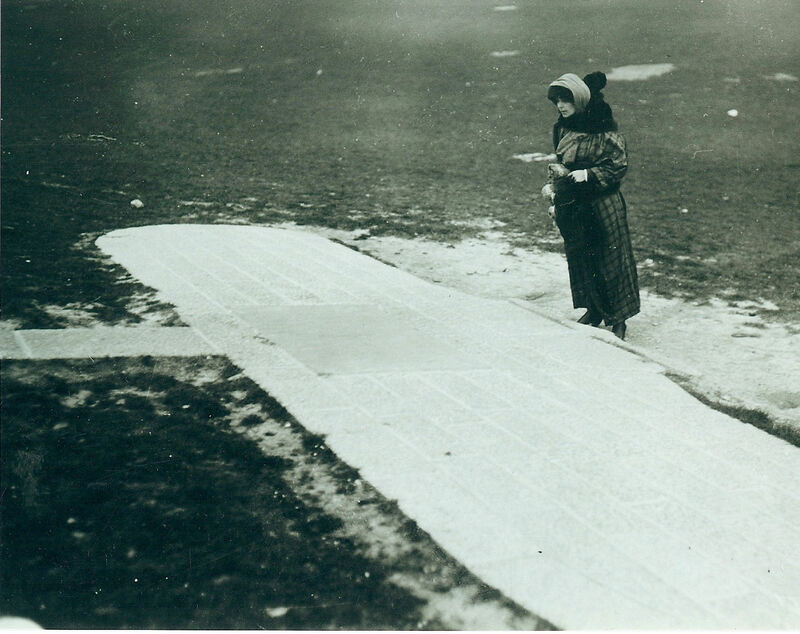 Before going to Whitfield, Harriet stopped at the Blériot Monument on Northfall Meadow. The Blériot monoplane had a 50hp Gnome engine and besides providing Harriet with the machine, Blériot had fitted a long pontoon within the fuselage to enable the plane to float until someone rescued her, if she came down in the Channel. At the aerodrome, Hamel undertook a trial run. Satisfied with the monoplane, Harriet climbed aboard and took off at 05.30hrs. Within thirty seconds, she had climbed fifteen hundred feet and flew over the Castle. There, Mirror reporters were waiting to take pictures of her flight. As the early morning mist cleared, Harriet could see France on the horizon, however, part way across the Channel she ran into a bank of cloud, which obliged to use her compass in earnest! When she thought she was nearing Hardelot, Harriet dropped down below the cloud but unfortunately, she did not recognise where she was so landed on a beach. 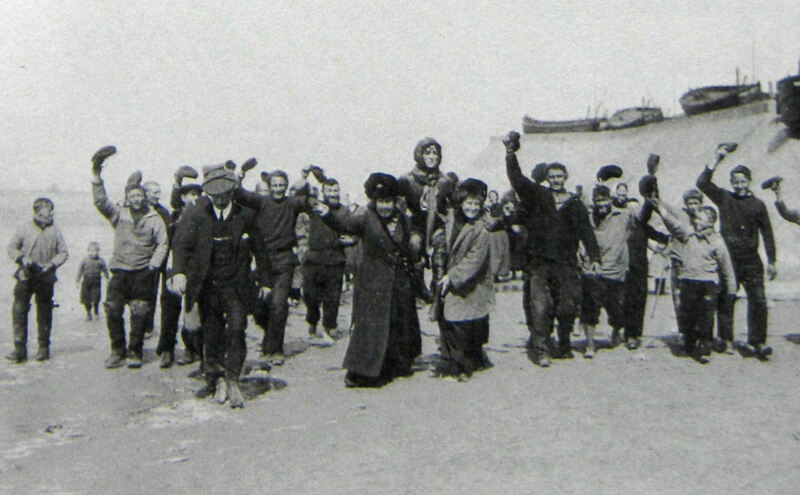 Soon a crowd of fisher folk gathered, congratulating her. Then according to Harriet, one of the women “insisted upon serving me with a very welcome cup of hot tea, accompanied by bread and cheese. The tea was served in a cup fully six times as large as an ordinary teacup and was so old and quaint that I could not conceal my admiration of it.” The fisherwoman let Harriet keep the cup. The feat had taken 59 minutes and Harriet had actually landed on Hardelot-Plage*! Then the media arrived and Harriet was assured of her entry into the history books as the first woman to fly the Channel. Even though the Mirror did give the flight coverage but it was not on the front page. On 14 April the Titanic tragically hit an iceberg off the coast of Newfoundland so although Harriet had made world history her story was relegated to the inside pages. 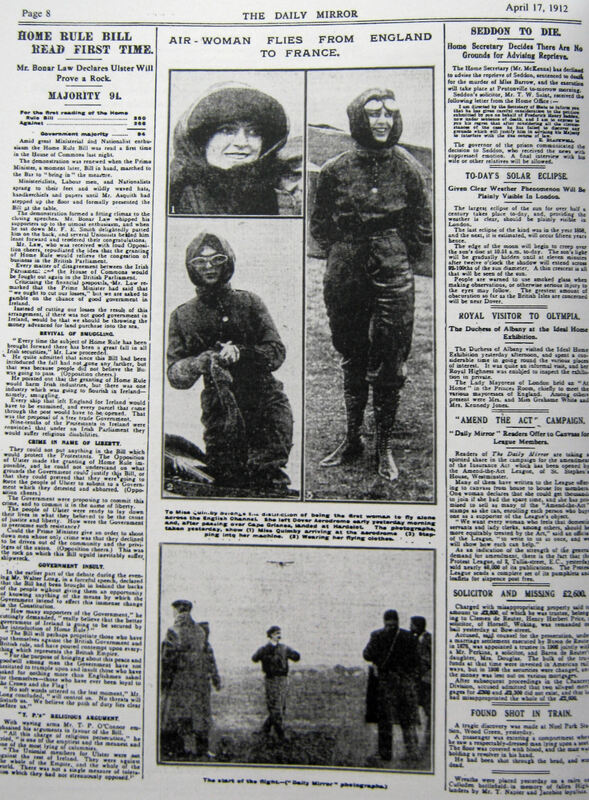 Harriet’s account of her epic journey was published in Fly Magazine of 12 July 1912 but by then Harriet was dead, having been denied the recognition, as the first woman aviator to fly across the Channel, she deserved. Following the Channel crossing Harriet returned to the US, where she was given a tumultuous welcome and the outfit she wore during the flight was copied by the fashion conscious. 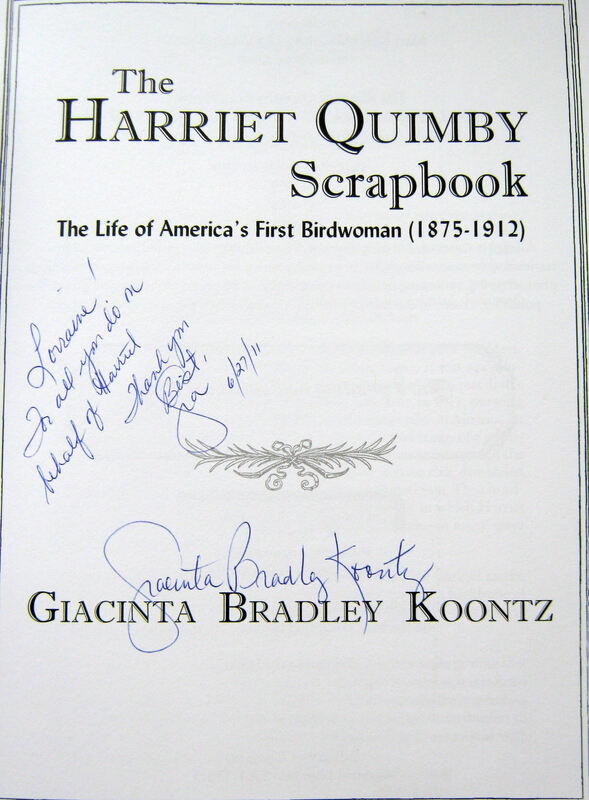 However, it was flying that Harriet loved and on 1 July she was at the controls of her new 70hp Blériot at Quincy near Boston, Massachusetts. Tragically, the engine failed and Harriet, along with her manager, Leo Stevens, fell to their deaths. Harriet was 37 years old. Less than a year later, on 2 June 1910, Charles Rolls (1877-1910) made a return flight across the Channel. Leaving Dover at 18.30hrs was over Sangatte, France, at 19.15hrs and was back in Dover at 20.00hrs. Over 3,000 people witnessed the event, after which he was carried through Dover, shoulder high. A month later Charles Rolls lost his life in a flying accident at Bournemouth, a bust of him can be seen on Marine Parade. Finally, at the Ramada Hotel, Whitfield there is a plaque commemorating the Harriet Quimby flight. * Recent research suggests that Harriet landed at Equihen, Pas de Calais. This entry was posted in People, Quimby Harriet - the First Woman to Fly the Channel. Bookmark the permalink.